MFG School of the Month: Cardinal Manufacturing - SFA Inc. 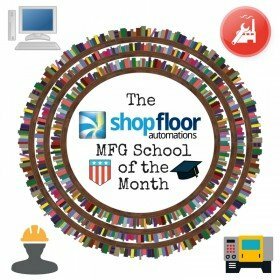 In a new blog installment from Shop Floor Automations called MFG School of the Month, we want to take a moment to highlight a place of learning that is helping to keep the Made in America movement going. We encourage you to check out our previous, separate pieces on Workshops for Warriors, OSML, and Edge Factor, but for now, we want to take a look at what Cardinal Manufacturing is doing. The Cardinal Manufacturing program from the Eleva-Strum School District has been in operation for 10 years. The public school system is also known for their Digital Learning Initiative. They are clearly striving to keep their students up to date with current technology, as it relates to getting a career. Cardinal is treated as a fully operational machine shop, where locals can order machining, welding, or fabrication jobs from the students. Check out a video from Modern Machine Shop about this terrific school. The school will be holding a workshop on Wednesday, June 21, 2017 for potential future students to come and see what their futures could look like! If you want information on how to increase productivity in your machine shop, contact Shop Floor Automations today. Reach us at (877) 611-5825 or chat with us on social media.